Because I live in Hastings, playing a wargame on this battle has always been a must. I have two different versions of wargames based on Hastings. 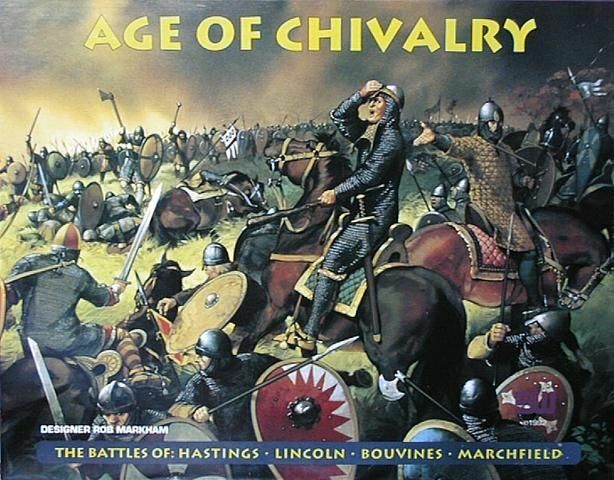 One is from the Age of Chivalry Quad, published by 3W and designed by Rob Markham. The other is an S&T magazine game designed by Richard Berg. I went for the 3W game mainly because I know the game system, which is an off-shoot of the Royalist and Roundheads system, so it meant I could get the game started in a very short time, without the need to read the rules through and without the inevitable page flicking the rule book whilst playing. 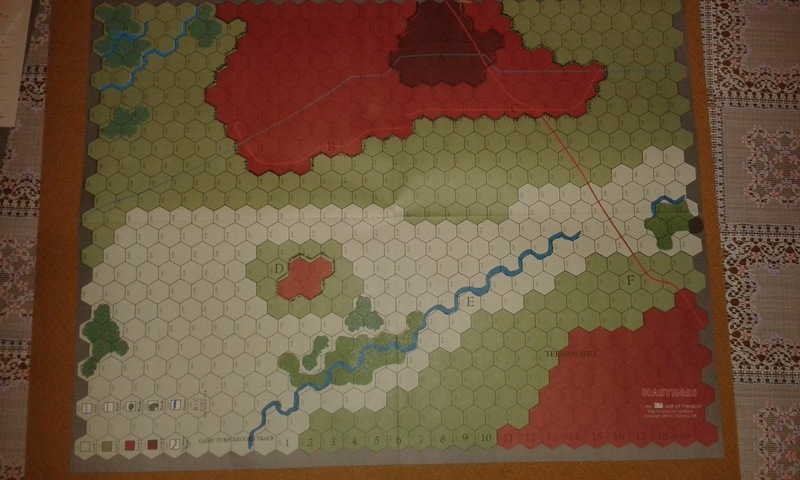 I wanted to do with this game was to see how accurate (depending on the sources) the map detail and army forces are. Yes, I have checked out resources online, which to be fair, is an easy way to find general information, but I also have a copy of A.H. Burne's The Battlefields of England, which is interesting as he writes very much with a military mind, and of course offers his own opinions with that mind set. The map for this game conforms to most of the resources I have come across (and is extremely similar to A.H Burne's map). What minor differences I came across could really be subject to differences of opinions. The forces involved is a problem, as there seems to be no concrete record, and some of the various sources I have seen vary greatly, but there does seem to be a general idea that both side had between 9-10 thousand men each. 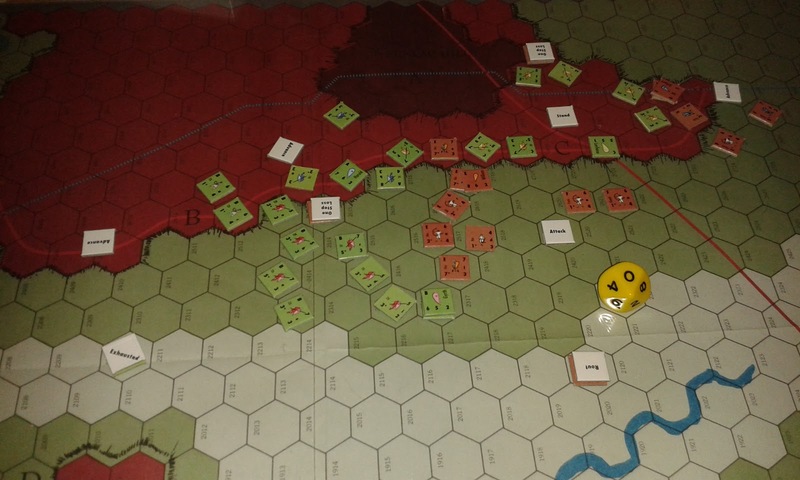 This battle has two game lengths - 16 turns for the Battle scenario and 19 turns for the Campaign scenario. 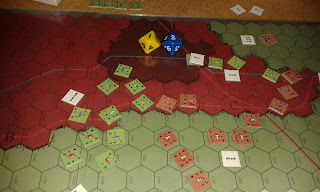 The difference being is that the Battle scenarios has the counters starting within certain hexes on the map, and the campaign has no counters on the map, but there are entry hexes where the counters can start arriving. 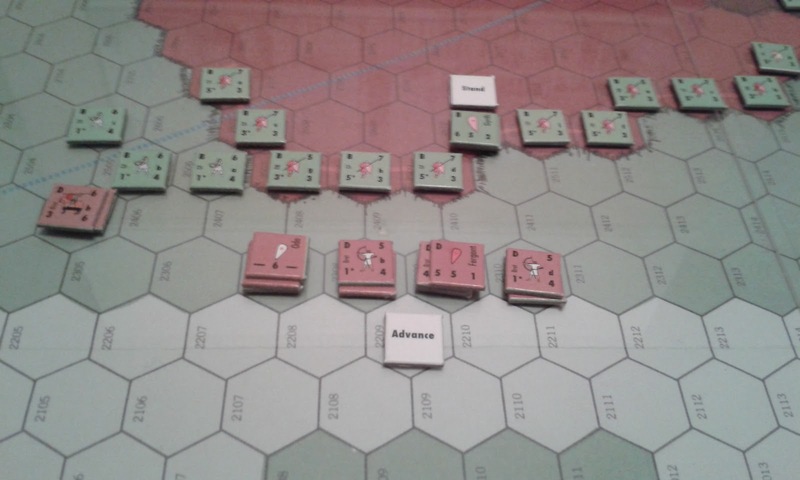 The latter gives the player a bit more control has to how and where to position his units, which is similar to Legion by Society of Ancients. I decided on the Battle scenario and positioned the armies like so, Saxons in the North, Normans to the South. One of the interesting aspects of the Royalists & Roundheads system is the Commands or Orders. 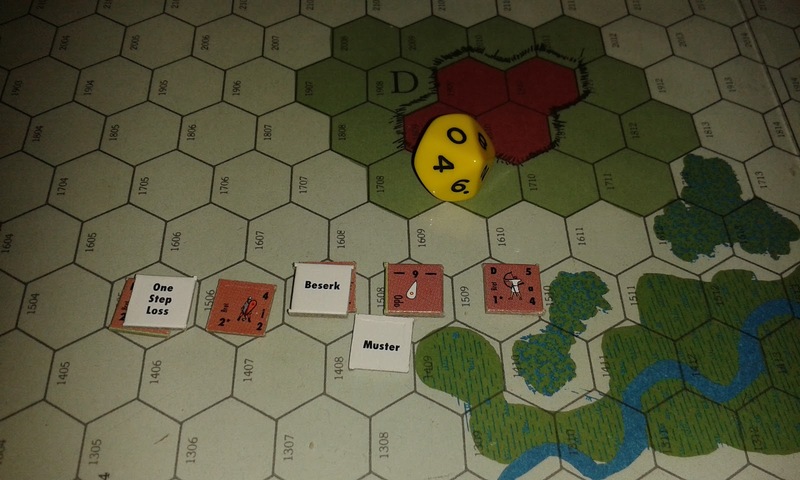 At the beginning of the scenario, each leader and overall leader is given a Command marker - Attack, Advance, Stand, Retreat, Reserve and Muster. At the start of subsequent game turns, they can either stay with those Commands or try to change them, but there is always the chance the change could fail and they will carry on with their existing orders - sometimes with dire results! Movement and combat is handled pretty much in the standard way for hex and counter games, and with combat, the sequence is defensive (non-phasing player) then offensive (phasing player) fire followed by melee. Cavalry can charge as long as the command they are in are under Attack orders. Another interesting aspect to this game, is the Unit Type Modifier Table, which may give column shifts on the Combat Results Table depending on what type of unit is attacking or defending. Facing is done with the hex apex to the front, so you have two front, two flank and two rear zones of control. Stacking is not allowed, but is at setup stage only if specified in the scenario setup. Once stacked units split, they cannot re-stack. Morale checks are done for individual units due to results from combat. If they fail, they rout, but they can recover from this. The game starts with the Saxons strung out across Senlac Hill (Santlache or Sandlake) using the Stand command. This command will give them a bonus when attack plus a Shield Wall bonus. The Dukes forces are in three small groups - Bretons on the left, Normans in the middle, and French to the right. They all start with the Advance command. 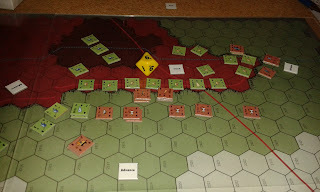 The Dukes forces move and advance first, with their archers trying to soften up the Saxon line before the infantry arrives. My poor dice rolling (nothing unusual here) meant the archers proved very ineffective. The Breton infantry make contact with the Saxons first, with their cavalry trying to take out the Saxon slingers. 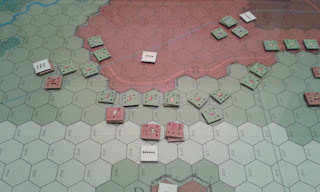 The Saxon Shield Wall does it's job and the Bretons attack fails, with some of them routing. 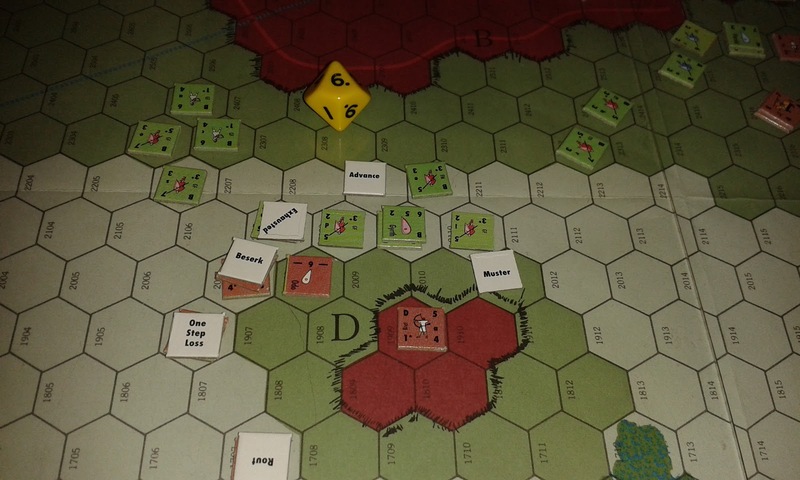 Sensing there is a chance to destroy the Bretons, the Saxon Leader who faced the Bretons change their command and take the fight to them. Meanwhile the Norman Archers are having slightly better luck with their archers and manage to reduce some Saxon units before the Norman infantry go in. 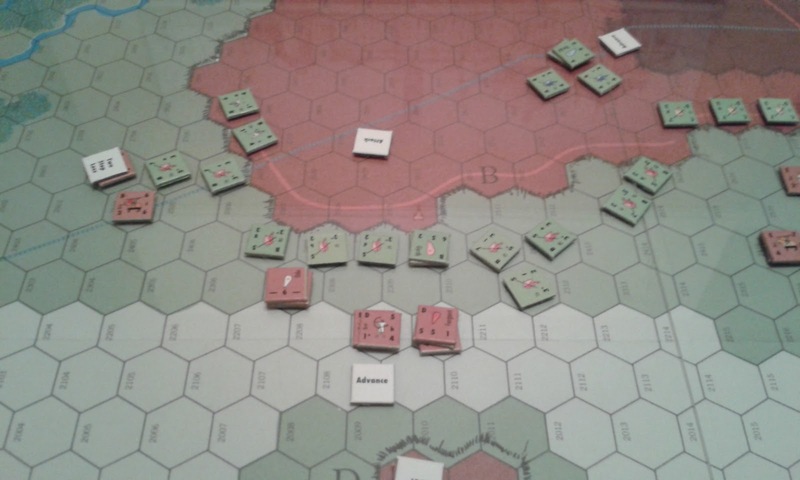 The French on the right try to take out the small number of units on the Saxon left flank. 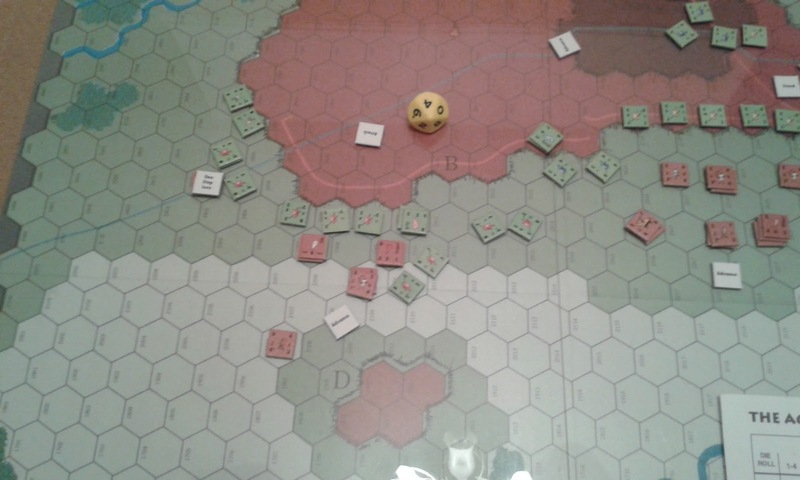 By turn 4, it has gone really bad for the Bretons, as they have lost units and what is left has lost cohesion. 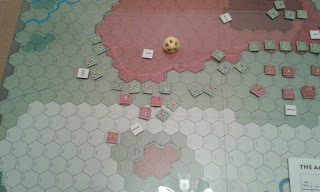 The Saxons start to persue and also turn some units into the centre to threaten the Norman right. The Normans and the French are still slugging it out against a formidable shield wall, making minimal gains. Turn 6, and the Bretons are really struggling and are basically running away with the Saxons in persuit, which results in the Bretons losing their Leader, and are now being commanded by a subordinate Leader. The rest of the Dukes army is really making slow progress, and the Saxons are really gaining the upper hand and continually to push further into the centre, causing great alarm to the Normans in the centre. 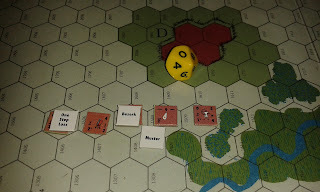 The Bretons change their command to Muster, which allows their leader to a better chance to gather his troops together (what is left) to form up and to try and be a cohesive force again. By turn 10, it is already looking very tricky for the Duke. Although he has broken the Shield Wall, The Saxons that were perusing the Bretons, are now engaging the Duke's Normans in the centre. The French have also broken the wall and are on the hill, but these breakthroughs are too little too late. The Bretons, who are still intacked, are stuck on the Muster command and are unable to come off it, rendering them useless on the battlefield and no threat to the Saxons. 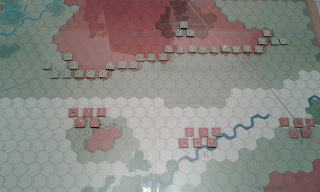 By turn 12, it was looking even worse for the Duke even though he had made advances on the Saxon line on Senlac Hill. The Breton's were still refusing to take part in the action, unable to come off their Muster Command. 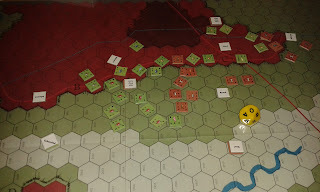 The Duke had by Turn 11, destroyed enough Saxons to be able to roll on the "Sudden Death" victory chart. He succeeded in turn 12 to win this game using the "Sudden Death". The day was won for the Duke through more luck than judgement. Well, I do like the Royalist & Roundhead system, and I certainly enjoyed this game, as it played well, quick and fast, and with an alarming similarity to the actual battle. The Commands system is good, as it shows how problematic it could be for the Main Leader to be able to change the Commands of his subordinate leaders. My only dislike is the Sudden Death Victory, but this is something you do not have to use, and I could have carried on playing until one side was wiped off, or beyond any hope of victory. The map graphics are fine as are the counter graphics - fully functional for want of a better expression. The rules are well laid out and easy to understand. Ahh, I've been to the Culloden battle site, also. There is a small museum, I visited there. 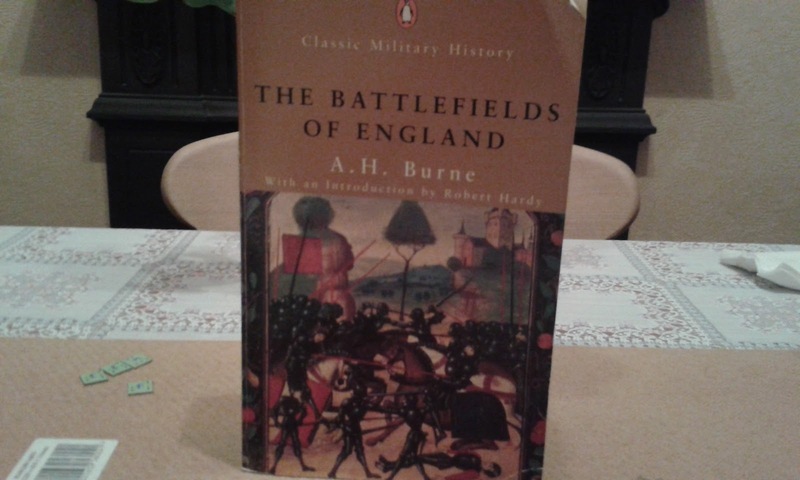 I have several books on the Battle of Hastings and the Normans, etc. Been reading some Historical novels on Hereward the Wake recently. I guess we are sorta similar in that I've never visited any battle sites over here. Thought about it, but never followed through. Joseph, thank you for the comment. I did forget when I wrote this that I also have the S&T issue "1066:The Year of Three Battles", which I would really like to get all three played from that issue. Quite bizarrely, I have lived in Hastings for 13 years and only in the past couple of years have I had any interest in the battle. Not too sure why I have ignored it. Similar situation when I used to live at Culloden/Inverness in the Highlands - the Battle of Culloden held no interest to me then. I've been to Hastings and Battle. I took the tour on Senlac Hill. For me, the Battle of Hastings was one of the top 5 battles of World History. I have this game but have not played it. Played other battles in the series. I've played the Richard Berg game you referred too. 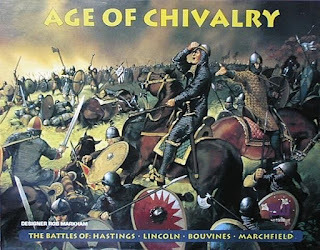 There are some other games on this battle: "Senlac Hill" by Norman Smith, S&T for May this year; "1066:The Year of Three Battles"(like the book), and A strategic campaign in another S&T out a year or so ago. Good review, will have to try my copy.